“We have done so, relying not on worldly wisdom but on God’s grace” (2 Corinthians 1:12). The wisdom that comes from the world is earthly, unspiritual, and demonic (James 3:15). It’s tempting to follow the advice of worldly wisdom because many times it seems to make sense—at least from man’s point of view. Yet the world’s wisdom only leads down the road of disappointment, regret, and pain. In contrast the wisdom of God brings us peace and direction for our lives. “Or do I make my plans in a worldly manner so that in the same breath I say both ‘Yes, yes’ and ‘No, no’?” (2 Corinthians 1:17). Worldliness thrives in the culture of lies and deception. The world promises to make people happy with pleasures, materialism, and instant gratification. Yet the truth is that there is enslavement to sin through addictions and failures. God’s word establishes a clear distinction between the truth and lie—we obey His word to avoid the traps of worldly manners. “It teaches us to say ‘No’ to ungodliness and worldly passions, and to live self-controlled, upright and godly lives in this present age” (Titus 2:11-12). When we were in the world, we had difficulty telling ourselves “no”. Many of us followed after our whims without any idea of the consequences to follow. The passions of worldliness can’t be satisfied even if every desire was granted. Through the power of the Holy Spirit, believers are strengthened and equipped to control their passions in order that they may be free. “Do not love the world or anything in the world. If anyone loves the world, love for the Father is not in them” (1 John 2:15). We can’t love both God and the world. Our hearts are drawn towards what we really want in this life. The love for the world is born out of an appetite for sinfulness and self-pleasure; whereas, a heart for the Lord is born out of the Spirit. We have been redeemed by the sacrifice of Christ to love God with all of our hearts and not the world. “For everything in the world—the lust of the flesh, the lust of the eyes, and the pride of life—comes not from the Father but from the world” (1 John 2:16). The characteristic of worldliness encompasses getting what we want, when we want it, and how we want it. The primary focus is on ourselves and not God or other people. When we recognize the sin of selfishness in our hearts, we need to confess and repent immediately. The lure of the lust of the flesh, lust of the eyes, and the pride of life is subtle enough that we may make excuses instead of confessions. “They are from the world and therefore speak from the viewpoint of the world, and the world listens to them” (1 John 4:5). Worldliness has a different kind of speech than of those who are called by God. Our speech is characterized by words of faith, encouragement, and hope. The speech of the world is punctuated by doubt, fear, and unbelief—those who live in worldliness may never recognize how their words separate them from God. Believers need to have ears that are quick to hear and understand when worldly speech attempts to entice them. Those ensnared in worldly corruption don’t even recognize their captivity. This corruption begins in the mind leading to death. Yet every believer before Christ was enslaved in sinful thinking followed by sinful actions. We escaped not by our own will, but rather by the grace and mercy of God. “Has not God chosen those who are poor in the eyes of the world to be rich in faith and to inherit the kingdom he promised those who love him?” (James 2:5). In the eyes of the world—believers are foolish to follow after a God they can’t see. Their vision has been skewed by sinfulness so that they don’t see or understand their terrible end of eternal darkness. Only through the gift of salvation do believers see the truth of God’s great love and surrender to His will. 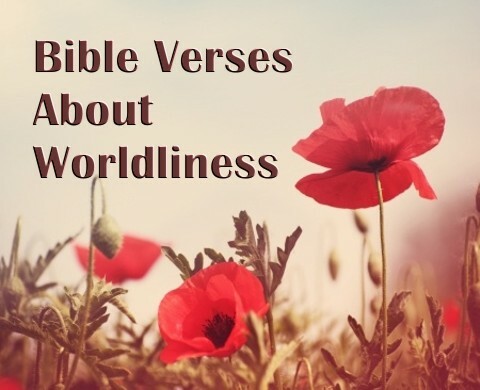 Worldliness is a tempting factor in the lives of believers who are engaged in the world. We can live in the world and not become a part of it as long as we stay connected to the Lord. Believers aren’t called to judge those in the world, but we are to love and intercede for those who are deceived. Through the transforming of our minds to the Lord Jesus Christ, we can know God’s will and live a fulfilling life. Jesus said the world is condemned(“judged”) already, so you are correct, we don’t judge because God’s Word has already judged the world(John 3:18,19). I just returned from a trip to Wash, DC. I was handing out some Christian tracks and was departing DC on my last day, bustling towards the subway on a busy street. A black lady, nicely dressed, ran to within 15 feet in front of me holding her fist to her chin, and stirring her hand stating, “This is not right…the aura is wrong” looking in front of my feet. There were many others walking beside me. She repeated this by running in front of me and confronting me with similar language. She was not high from what I could tell. Finally I said “God Bless You” and the dam burst. She cursed me with every curse I have ever heard and ended by saying, “I know your God… and I want Him dead”. Evil is real in this world and the battle is still joined between the forces of good and those of evil. If our spiritual eyes were opened I think we would be amazed at those angels protecting our flanks and the enemies of God attempting to impede our progress. Dear Christians please remember to pray always. “Rejoice always, pray without ceasing, give thanks in all circumstances; for this is the will of God in Christ Jesus for you”(1Thes 5:16-18). Prayer is the fuel which covers us with God’s protection and enables His Will to be accomplished through our lives. There are enemies to God’s Will and Purpose(His Kingdom) who are determined to oppose us. These are the wolves. This night, Halloween (in spite of the “fun” the children enjoy), reminds us again of the reality of this conflict. God wins in the end, but we must pray. Excellent article, Crystal. And right on time. There are so many posts on fb from “Christians” who don’t even realize the signifigance of what the post represents. I pray that God continues to open our eyes to the things that do not bring Him glory. I had to share this article. Keep allowing God to use you to bring insight to the world. Thanks much! My prayer is that the body of Christ will wake up out of her spiritual stupor and move with boldness for our Lord Jesus Christ. Thanks for sharing your insight on this topic. I think that even if an unbeliever has the head knowledge about God and still chooses to not honor Him–it’s a reflection of the darkness within them. I could be naive but my gut instinct is that woman doesn’t have a clue of the fiery eternal judgment she will experience with repentance. But you know I think it goes both ways…that there are believers who are living under the expectations of God and will therefore experience loss in heaven. They know it, but yet they really don’t know it completely in their hearts–because if they did, there would be much repentance within the body of Christ for the amount of time we waste on worldly affections versus our spiritual heritage. It was great hearing from you. I hope you have a blessed weekend. I have often wondered about the forces compelling those who do not believe in God to live evil lives, avoiding the light, and “choosing” instead to dwell in darkness. In the past I believed the classical view of evil…a separation between man’s, the world’s and the devil’s influence. The following Scriptures tells us that, “Let no man say when he is tempted, I am tempted of God: for God cannot be tempted with evil, neither tempteth he any man: But every man is tempted, when he is drawn away of his own lust, and enticed”(James 1:13,14). So man is not tempted by God but is drawn away by his own lust. So what is man’s lust and what influences the same? The Scripture tells us, “For all that is in the world, the lust of the flesh, and the lust of the eyes, and the pride of life, is not of the Father, but is of the world”(1John 2:16). This “world’s” course follows or operates according to its owner, the devil, as his spirit works in men’s hearts. They love evil for evil’s sake. Notice that they “know” the judgment of God, (vs 32), showing that they are not deceived as to their plight. These are like the religious leaders Jesus confronted calling them wolves(Mt 7:15) who sought to devour the sheep. Think about those still unbelieving after Jesus raised Lazarus from the tomb. They didn’t just “not believe”…they sought to kill Jesus for performing this miracle and Lazarus to boot(John 12:10). Finally there are those who are simply possessed by demon(s). This was not just an apostolic era occurrence. I believe Jesus cast out more demons from people than any other act of healing. These demon possessed people are still among us today. So in which category was this woman who confronted me on the streets of DC? I do not know for certain. I believe she was either possessed or a devout follower of satan(a witch). I pray for her each day, that God will show mercy and deliver her. I don’t think she wants deliverance but followers, but I still pray. How have you not discerned the evil of Halloween? Hello Jennifer. I do not see Doc’s statement that supports Halloween? Where did this come from? DocReits was only agreeing with Crystal’s statement, “Believers aren’t called to judge those in the world, but we are to love and intercede for those who are deceived.” That has nothing to do with Halloween. How you made that stretch is a mystery to me. DocReits is a rock-solid believer. Previous post: Should Christians Stockpile to Prepare for Future Disasters?